The Peony and Forget Me Not quilt block is a good choice when you want to make larger blocks. The advantage of this technique is that your resultant quilt is ready earlier (less blocks to make = faster end product). 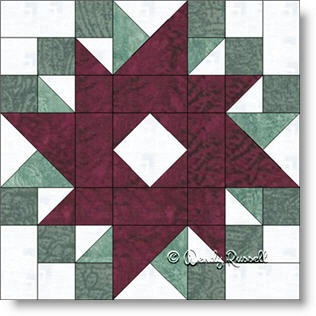 This block features half square triangles in two different sizes, as well as quarter square triangle pieces that are used to create an underused (at least in my opinion), patch which is often called a three quarter square triangle. It's fun to incorporate the latter patch in your blocks as it allows for specific shapes to emerge (in this case part of the "flower"). The centre patch is another familiar one - the square in a square unit. So, all in all, this quilt block is a valuable learning tool if your are new to quiltmaking. The two sample quilts illustrated are both set on point, with one quilt utilizing extra blank blocks to showcase your quilting skills, while the other quilt features more blocks that are separated by sashing strips. As you can see, you are only as limited as your imagination when designing how to create your own personal quilt.